Carlsbad Beauty - right across from South Carlsbad State Beach! PLEASE NOTE: THIS PROPERTY HAS A 30 DAY MINIMUM. Enjoy a LUXURIOUS home away from home on your Carlsbad vacation and directly across the street from South Carlsbad State beach! Better than a hotel - this home has so many more comforts and amenities. Gated Community. KITCHEN FULLY-STOCKED with coffee maker, dishes, flatware, pots, pans, knives, utensils, filtered water, spices, and cooking staples and condiments. Granite kitchen countertops. master bedroom features a NEW CAL KING poster bed, TV. High-speed Wi-Fi internet, walk-in closet and attached master bathroom, granite countertops, double sinks, and a SPA TUB. *Guest bedrooms - one guest room downstairs with full bathroom (perfect for older and some handicapped guests) and a two more guest room upstairs with attached full bathroom. Graco port-a-crib available. *Mature, controlled dogs are allowed indoors. Barking, digging, chewing and other messes must be controlled by our guests. It's literally right across the street from South Carlsbad State Beach in a private gated community that is great for family and friend gatherings. We have so many toys you can use at no cost including paddle boards, surf boards, boogie boards, beach toys, beach chairs and beach cruisers. 2600 square feet house, very comfortable, sleeps lots, Beach is 500 steps to sand. We live in Arizona but have always enjoyed San Diego for our vacations. We hope you enjoy our home as much as we do! South Carlsbad is the best area in San Diego County. Right across from South Carlsbad State Beach and walking distance to our favorite restaurant, Chandlers in the Hilton Resort. 2 miles North is the center of Carlsbad Village with tons of restaurants, shops, and tourist attractions. 1.5 miles Northeast is Legoland. 25 miles South is Sea World. 65 miles North is Disneyland. It's a great location where you hear the waves crashing at night. This was my third vacation in this home and enjoy it more each time. The location is amazing in a gated community direct across the street from South Carlsbad State Beach. There's a ton of beach and water toys the owner leaves for guests. We had room for our whole family and there's a nice park with playground, basketball, and great walking trails. The beach is literally 4 minute walk and great surfing, plus not crowded at all. Right on the back side of the community, you can catch the Coaster train. Legoland is about 3 miles away too! Summer, winter, and fall our whole family has enjoyed this house and will keep coming back. The owner is great and the house is very well maintained. The photos don't do justice to this home. 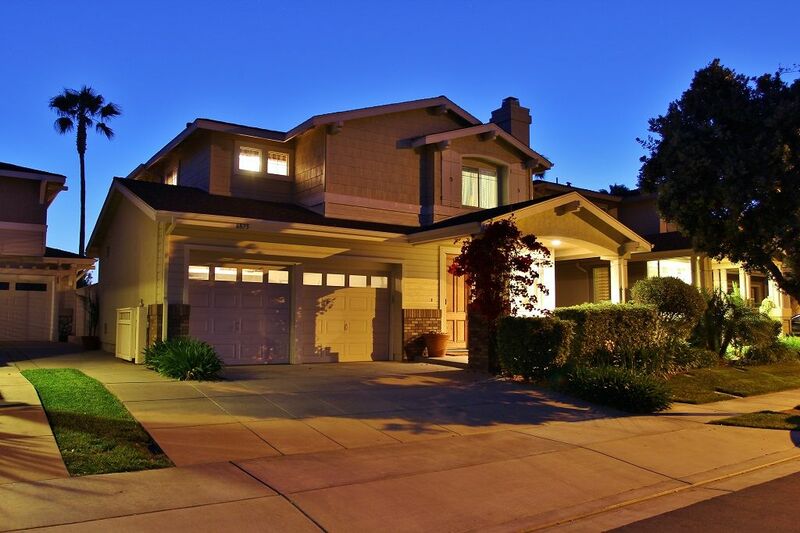 it is located in a gated community 2 miles from the center of Carlsbad. We loved the large size of the home and location. The loft area on the second floor was ideal for our kids as they made it their own movie watching area. The home was well stocked with everything you need for a beach vacation. The owner was very easy to work with and provided a lot of local information and recommendations. We especially enjoyed Pizza Port (2 times) THANK YOU We would definitely stay in this fantastic home again. The kids were so excited when we arrived! They couldn't believe how big it was. They were calling out which bedroom they wanted as they went through the house. My son is serving in the Army and can't come home for Christmas so we celebrated Christmas in October with him and had a wonderful vacation. The owner was very accommodating and easy to work with. We can't wait to come back. Community Playground, community basketball court, and bacci ball. We have lots of beach stuff for free! Surf boards, paddle boards, boogie boards, beach toys, beach cruisers, beach chairs, and surfer shower!